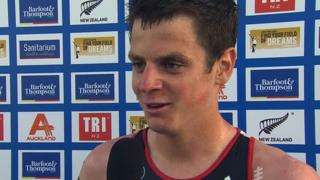 Britain's Jonny Brownlee says Javier Gomez "destroyed" him in Auckland, New Zealand, as the Spaniard wins the first Triathlon World Series race of 2014. Brownlee, who lost the 2013 title to Gomez in a sprint finish in London, was easily beaten but still finished a strong second ahead of Australia's Aaron Royle. Brownlee admits he "lacked a bit of sharpness", but is aiming to be fully fit for the Commonwealth Games in Glasgow this summer.